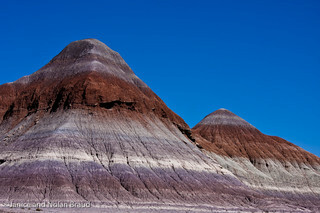 Painted Desert landscapes in the Petrified Forest National Park in Arizona. First established as a National Monument in 1906 by President Theodore Roosevelt, the park was greatly expanded in size and scope, and was established as a National Park by Congress in 1962. It is a vast preserve, a designated wilderness area, and an incredible source of fossils. Petrified Wood and painted desert scenes are the most visible treasures of the park, but many desert and wilderness habitats are preserved here as well as 13,000 years of human history and culture in fossils and archeological sites.